Product prices and availability are accurate as of 2019-04-24 17:53:20 UTC and are subject to change. Any price and availability information displayed on http://www.amazon.co.uk/ at the time of purchase will apply to the purchase of this product. Transform your patio, small garden, balcony or small space with an outdoor water feature. The peaceful sound of running water gives a sense of tranquillity and harmony. And if you’re a nature lover then a water feature will attract wildlife into your garden. 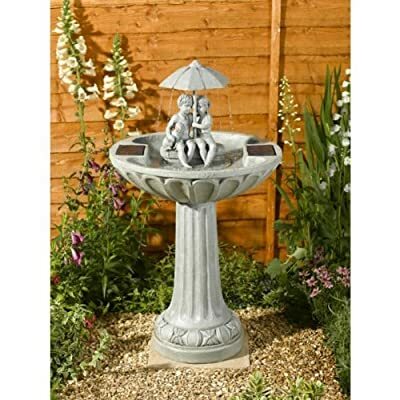 This fountain is a modern design making it an ideal focal point for any contemporary garden. Whether your garden is formal or informal the addition of a water feature will create a stylish focal point. 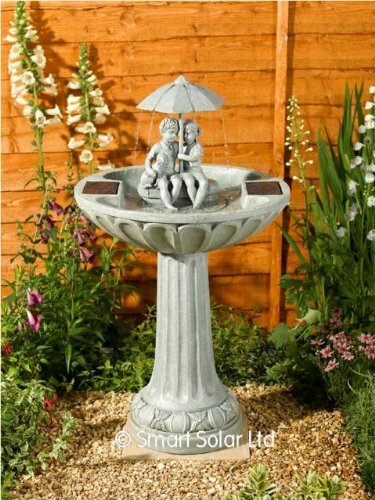 This water feature is a beautiful rendition of two children and a dog sheltering under an umbrella which protects them from the endless cascade of water from the fountain. A delightful display to behold this entrancing feature is ideal for creating a peaceful oasis in your garden to soothe relax and take your attention away from the stresses of modern day living. Designed to be eco-friendly and easy to use this water feature is powered by two integral solar panels making this attractive and practical with no mains wiring and no operating costs. An innovative pump system recycles the water from a hidden reservoir with a filter keeping the water clear from debris. Simply put in place and enjoy the beauty as the rippling water begins to flow and dapples the surroundings with reflected light. Please note: This feature is solar powered and the solar panels must be positioned in direct sunlight in order for it to be fully functional. Full instructions are included. Create a captivating display and transform an outdoor space with this elegant water feature. The sound of gentle running water in your surroundings will evoke a sense of tranquillity and harmony that will not only enhance your quality of living but will also attract wildlife and birds bringing you closer to nature. This charming feature will make a stylish focal point and will blend into the background in a most natural way. 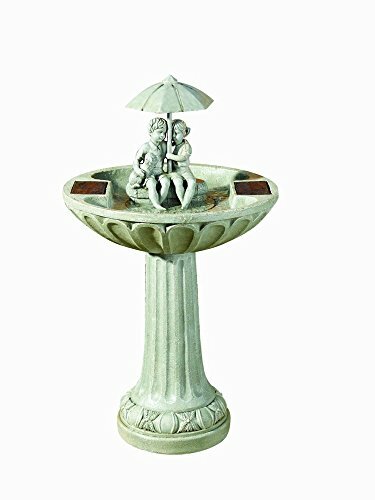 Highly appealing this showcase piece is finely detailed with a beautiful rendition of two children and a dog sheltering under an umbrella which protects them from the endless cascade of water from the fountain. A delightful display to behold this entrancing feature is ideal for creating a peaceful oasis in your garden to soothe relax and take your attention away from the stresses of modern day living. Designed to be eco-friendly and easy to use this water feature is powered by two integral solar panels making this attractive and practical with no mains wiring and no operating costs. An innovative pump system recycles the water from a hidden reservoir with a filter keeping the water clear from debris. Simply put in place and enjoy the beauty as the rippling water begins to flow and dapples the surroundings with reflected light. Product Specifications:Integral solar panelsIncludes low voltage water pump with filterConstructed from maintenance free resinDimensions: H 82 x W 47.5cmPlease note: This feature is solar powered and the solar panels must be positioned in direct sunlight in order for it to be fully functional. Full instructions are included. At ‘Patio Cascades’ we handpick all our water features so you have the best selection of items at affordable prices. We use Amazon.co.uk to fulfill and ship all our water features in our Online Shop. This means that you can shop with confidence knowing that your items will be supplied using Amazon's top quality shipping service, secure payment processing, first rate customer service and online order tracking. Also every order is covered by Amazon’s 30 day money back guarantee.